Find the Right Profesional Wedding Planners : Destination Hawaii Wedding: The Best Way To Get Hitched! Find cost-friendly wedding packages at us! We are the best Hawaii wedding planners to turn your wedding ideas. Our wedding planners are providing best marriage arrangement to their clients within their budgetary requirements. Choose us for the best wedding planning! Destination Hawaii Wedding: The Best Way To Get Hitched! Whether you are eloping or planning for a destination wedding in Hawaii, any sort of wedding ceremony can no way be better than the Hawaii Wedding. Hawaii weddings are like those fairytale weddings where the bride gets to dress up like a princess and the groom like her prince charming and then both kiss each other in solace in the lap of nature. Oh, wonder, how beautiful the scene would be! It was the Saturday morning of 13th of January 2018 when Ashley and Daegan were all set to tie the knot, in the presence of Reverend Michael Nelson, at Waialae-Kahala Beach. It was because of the Hawaii wedding planners they had opted for, even the ballistic missile threat in Hawaii didn’t shudder them nor prevented them from taking the vows of love. The couple arrived at the park all relaxed, Ashley was decked up in a white lace gown while Daegan in a formal white shirt and trousers. They both looked stunning together. Hand in hand, strolling across the beach they came when the conch blew, thus, signifying the start of the holy wedding ceremony. It was followed by a unity sand ceremony, taking of vows, exchanging rings, Hawaii lei exchange symbolic of the gift of love. 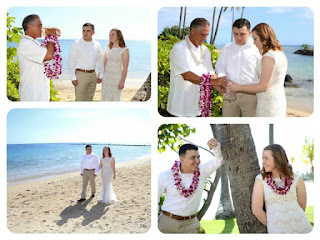 Having married in the court, Jay and Amy relived their wedding moments in the Hawaiian style wedding, by choosing the Paradise Hawaii wedding package, at Magic Island, Ala Moana, on 30th December 2017. Amy flaunted in her exemplary white wedding gown with an alluring French bouquet and a white orchid Haiku head lei while Jay looked killer in his cream-colored suit. The ceremony was conducted by Reverend Michael Nelson. 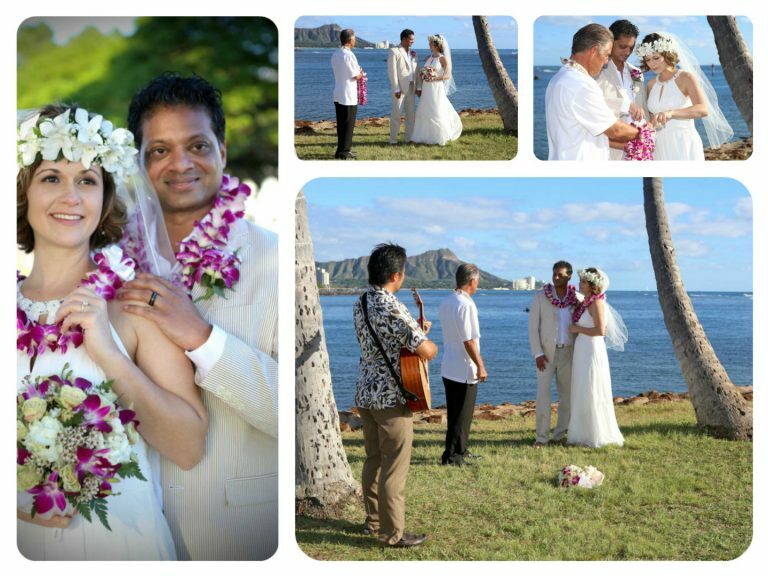 In addition to the similar Hawaiian wedding proceedings, Hawaiian wedding song was sung to the tunes of the guitar along with beautiful videography and photographic moments. The end of the ceremony was splendid with the couple on a limousine ride, along with the champagne service, around Honolulu. Dinner was served at the Signature restaurant. 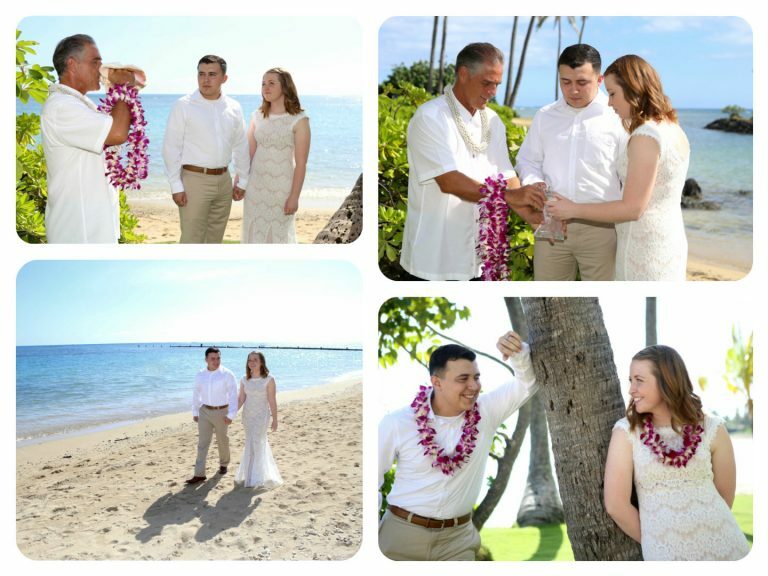 The Plumeria Plus Hawaii wedding package fulfilled their dreams on 12th December, 2017 at Waimanalo Bay Beach in the presence of Reverend Mike. This couple lived their intimate moments with their beloved parents. Kristen wore a stylish white gown and Calvin was dressed in gray trousers with the white shirt. Kristen looked fabulous in her multicolor floral Haku head lei. The ceremony had similar proceedings as above followed by the couple dance. What a joyous moment it was! They proceeded with the Plumeria package which led to the most happening moment of their life on 19th December 2017 at Waimanalo Bay Beach. What a heavenly aura it was amidst their parents and loved ones! Reverend Mike officiated it. Marlea held a beautiful bouquet of yellow orchids with heirloom ancestral photos. The newlyweds were given Kukui nut leis while others the orchid leis. Their plan of a Hawaii wedding and honeymoon indeed came out to be marvelous one! So, what fascinates you to have your destination wedding in Hawaii? Is it that white gown any of the above brides wore or the unique Hawaiian tradition? No matter what it may be, the Hawaiian weddings are sure to make you get over those outrageous traditional wedding costs, thus helping you to set your own wedding goals right in your budgets. Credits: Denver Travel Information, San Diego City Guide, Hotels San Antonio TX.